Rating: Short and easy family stroll on a level trail. 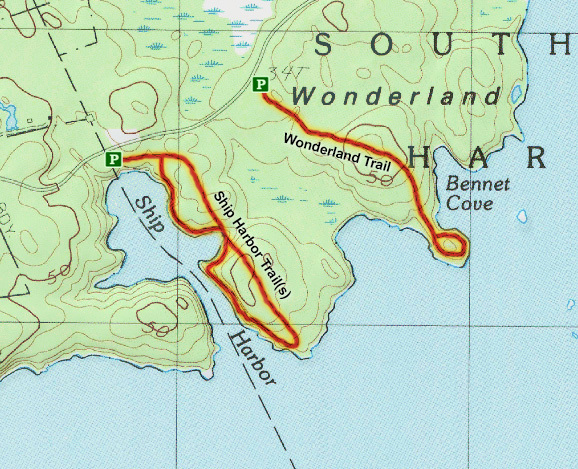 The Ship Harbor Trailhead is located along the looping Route 102A southeast of Bass Harbor roughly half a mile west of the Wonderland Trailhead; this is the "quiet side" of Mount Desert Island, west of Somes Sound. The small parking area is clearly marked and is usually full in mid-afternoon in the summer months, but some extra roadside parking spots are available. The Ship Harbor Trail is extremely well groomed and is easy to follow as it heads southeast through a beautiful section of forest as it hugs Ship Harbor. The trail has two optional spurs (see map below), but the trail that hugs the harbor is arguably the most scenic. Since Ship Harbor is a relatively shallow inlet and as such, it is interesting to watch the tides flow in and out of the narrow channel. A short spur trail even leads down to the water in the harbor. 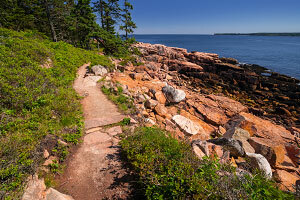 Soon enough, the trail reaches the ocean and it's time for random exploration of the rocky shoreline. 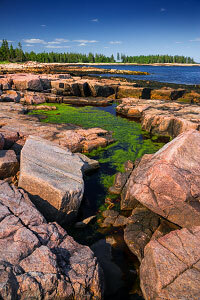 Children and adults of all ages enjoy wandering and relaxing along the coast and examining the various tidepools. (A smartphone app like "Tide Chart" is very useful for determining low tide.) Please tread lightly when hunting for life in the tidepools; this is a popular spot and humans can have a negative impact here. When you have had your fill, return the way you came. Note: For an optional longer hike, you can continue hiking east around the bay to join up with the nearby Wonderland Trail. While not as dramatic as the scenery along Acadia's more famous Ocean Path coastline, the Ship Harbor Trail is a fun hike for adults and children alike. There are many great spots along the shore to have lunch or before or after your hike, you can try one of the nearby lobster pounds just outside of the park.